It is every entrepreneur’s dream that one day their children will continue the legacy.. For Frances Wedlake that dream was realized not only with her son, Ken, but again when her grand daughter, Jennifer Wedlake recently joined the team in March. “There are lots of parents and children working as teams but I think we are the only team in Oakville that spans 3 generations” says Frances, proudly. Her first job in high school was in a restaurant and her step mother, whose family consisted of over 50 members (over 70 when her father’s side was included), would wake her up at 5 am on the morning of family gatherings so that she could help with the cooking.She attended and graduated from the Culinary Arts at Niagara College and worked as a chef at major hotels and upscale venues. “It’s very tough on the body” says Jennifer, referring to the restaurant industry, “you’re scheduled for 8 hours but you always end up working 14 plus the shift work can be gruelling – actually it’s a lot like real estate” she adds, laughing. After 13 years Jennifer had had enough of the heat and, with stitches on every finger, decided it was time to get out of the kitchen. Real estate clearly made the most sense: “I knew one day my grandmother and father would retire. As my brother was not interested I knew I would be the last family member to take on the legacy”. Jennifer joined the family business in May 2016. The elder Wedlakes soon realized how very fortunate they were to have Jennifer on the team. In addition to taking over so many of the daily ­responsibilities, as a member of the younger generation she adapted perfectly to updating the website and getting the team up and running on social media. In May, Jennifer wrote her final exam and became a full fledged member of the team in June. One of the great ­advantages Halton residents have when working with the Wedlakes is, because they are close-knit family members, they work very well together. “We try to do everything together and we all have knowledge of what is happening in the team and also in the neighbourhood. Even though a listing may ­belong to me, both Jennifer and Ken have full knowledge and can take over at any time. That makes us very accessible for our clients” says Frances. The Wedlakes clearly know Oakville. Frances has lived here since 1954 (in Bronte since 1974) and both Ken and Jennifer grew up here in Bronte. 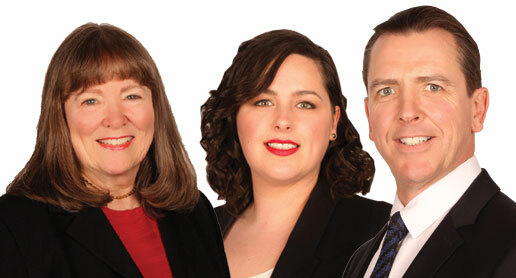 Frances started her real estate career in1985. She had always been interested in real estate and took a night course with her sister-in-law thinking she would work part-time. At her first job, she was told that she would have to earn $25,000 her first year or else she would be out! “I thought I would never be able to accomplish that” says Frances. However, she went far beyond and has never looked back! Frances has reached the top awards with Royal LePage reaching National Chairman ‘s Club Lifetime (top 1% in CANADA) and the Award of Excellence Lifetime. Ken has earned similar credentials, reaching Diamond – an award given to the top 3% in the company.